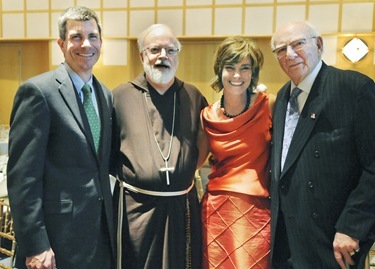 Catholic Charities had their annual Spring Celebration at the JFK Library on Thursday May 21, which happened to be Ascension Thursday. We were honoring Ray Tye, who was the recipient of the Justice and Compassion Award. He is the president of The Ray Tye Medical Aid Foundation, which provides essential medical procedures to families in need. 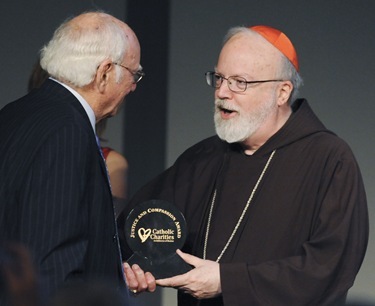 It was the first time Catholic Charities presented the award to a member of the Jewish community. What a wonderful milestone! 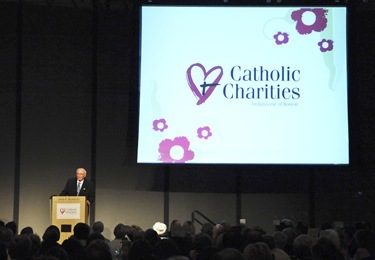 The evening was a great success—they matched last year’s $1.5 million—and, given the demands that are on Catholic Charities’ direct services to the poor and to those who are losing their homes and their jobs, it was more important than ever that the evening be successful. After the fundraiser at the JFK Library, I went back to the rectory where we had a birthday celebration for Father Kevin O’Leary, the rector at the cathedral. It was a small get-together of priests, but among them was Bishop Hennessey who brought Bishop Donal McKeown, the Auxiliary Bishop of the Diocese of Down and Connor in Northern Ireland, who was in town visiting relatives. We sang happy birthday to Father O’Leary, who works so hard as our rector, and had a very nice evening together. 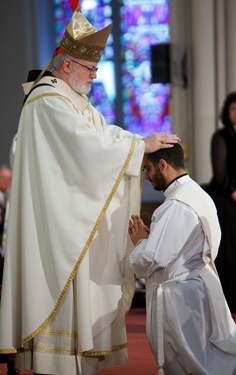 On Saturday we ordained six of our seminarians into the priesthood. 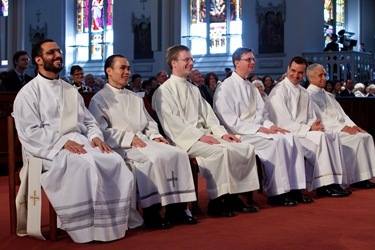 The newly ordained are Fathers Israel Rodriguez, Huy Nguyen, Seán Maher, David Gunter, Shawn Carey and Frank Camp. 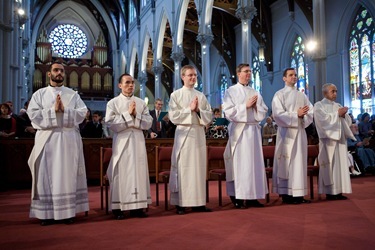 I was very struck by the diversity of the ordination class. 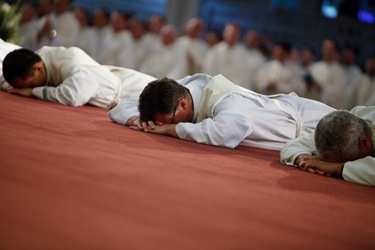 As I mentioned in my homily, 50 years ago we would have had 50 men in the ordination class. 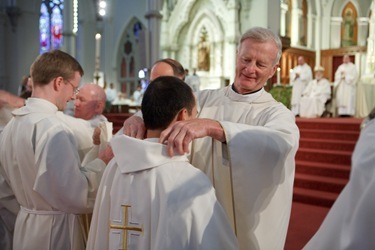 But those huge ordination classes wouldn’t begin to reflect the catholicity of this year’s class — a widower, a deaf man, an Irish immigrant, a Vietnamese refugee and a Hispanic member of the Neocatechumenal Way. 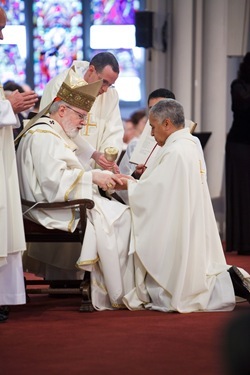 I said it had been suggested that we celebrate the ordination in Gaelic, Bostonian, Sign Language, Spanish, and Vietnamese. I joked that it was tempting until I got to the Vietnamese, which is a tonal language where every syllable can be pronounced in six different ways, providing infinite opportunities to make a fool of yourself. 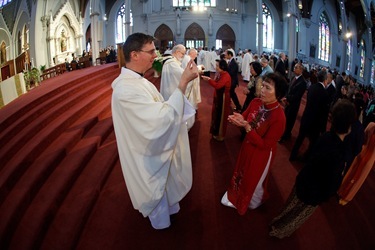 I told the people was I worried that I might ask Father Nguyen to marry an Arab rather than pledge himself to celibacy! 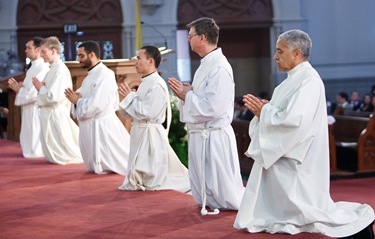 Father Rodriguez had served at the cathedral during his diaconate, so he had his reception across the street in the gymnasium of Cathedral High. Since it was just across the street, I was able to stop over and greet his parents and his brothers and sisters who came to be with him. 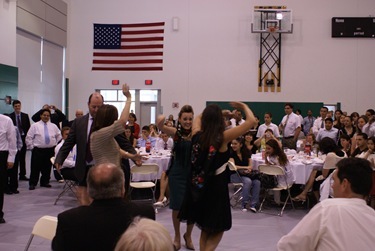 Unfortunately, I wasn’t there long and was sorry to hear that I missed the flamenco dancing that followed! 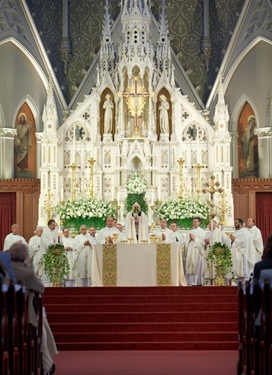 Over the Memorial Day holiday, I went to be with the Capuchin Friars in Pittsburgh and to celebrate a convocation on the theme of the 800th anniversary of the Rule of St. Francis. The entire province was there, including some representatives of our men who are in Papua New Guinea and in Puerto Rico. In all, there were around 150 to 200 of us. St. Francis defines Franciscan life as living the Gospel. The Rule of St. Francis was originally just a few quotes from the Gospel that define our mission and our trust in God’s providence for us. Francis saw the friars as lesser brothers and that, in some ways, underscores being a universal brother to everyone. The menores were the lower-class people that he wanted the friars to identify with and to announce the good news to — preaching a Gospel of conversion and inviting people to discipleship. At the time, it was a very apostolic movement that gave a new way to live religious life, as opposed to in the monastery. The towns were growing and the monasteries were a rural phenomenon. The friars then were able to be in the cities and have the mobility that the Church needed at that moment. St. Francis called for a General Chapter called Chapter of Mats to be held around Pentecost. He said it should be held at this time because the general of the order should be the Holy Ghost. 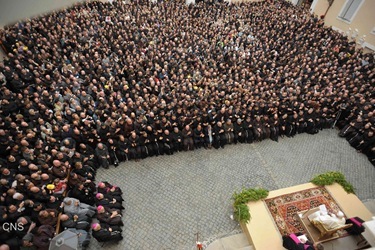 Several weeks ago, there was a replication of that experience in Assisi with representatives of the entire Franciscan family gathering together. There are three branches to that “family”. The original group is the Conventuals, or the “Black Franciscans,” who are today are the least numerous. This is the order St. Maximilian Kolbe belonged to and that, in our archdiocese, runs Our Lady of Czestochowa, the Polish Parish in South Boston. The second group is the Observants, represented in the archdiocese with the Arch Street Franciscans at St. Anthony Shrine and those at the Province of the Immaculate Conception in the North End. 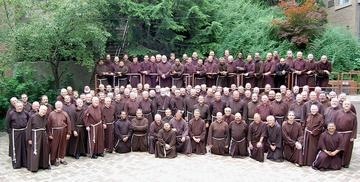 The Capuchins, my order, is the third group. 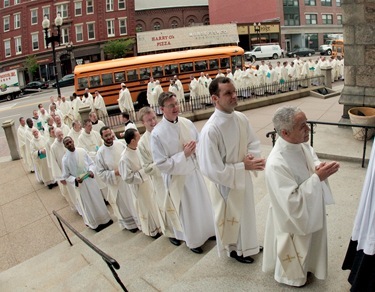 In the archdiocese, they run Our Lady of Lourdes Parish in Jamaica Plain. 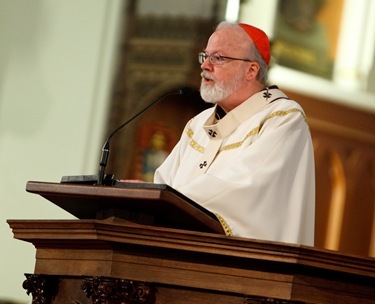 During the Assisi gathering, the preacher to the papal household, Father Raniero Cantalamessa, who is a Capuchin, gave an address. It’s a bit long to include here, but I recommend you read it in its entirety. I welcome you with great joy at this happy and historical event which has gathered you: the eighth centenary of the approval of the “Protorule” of St. Francis by Pope Innocent III. 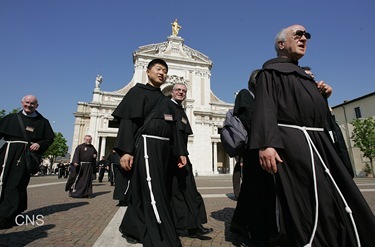 Eight hundred years have passed and that dozen Friars has become a multitude, scattered across every part of the world and today here, is worthily represented by you. In the past few days you have been meeting in Assisi for what you have chosen to call the “Chapter of Mats”, to recall your origins. And at the end of this extraordinary experience you have come together to see the “Lord Pope”, as your Seraphic Founder would have said. I greet you all with affection: the Friars Minor of the Three Obediences, led by their respective Minister General, among whom I thank Fr. 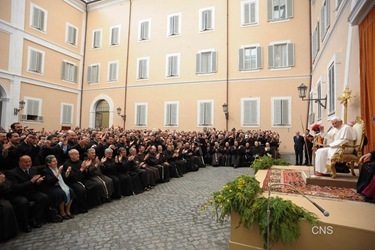 José Rodríguez Carballo for his courteous words; the members of the Third Order, with their Minister General; the Franciscan women religious and the members of the Franciscan Secular Institutes; and, knowing that they are present in spirit, the Poor Clares who constitute the “Second Order”. I am glad to welcome several Franciscan Bishops; and in particular I greet Bishop Domenico Sorrentino of Assisi who represents the Church of Assisi, the native region of Francis and Clare and, spiritually, of all Franciscans. 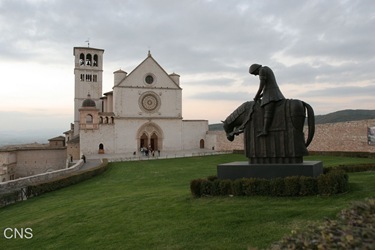 We know how important for Francis was his relationship with Guido, the Bishop of Assisi in that period, who recognized his charism and supported him. It was Guido who introduced Francis to Cardinal Giovanni di San Paolo who then presented him to the Pope, encouraging the approval of the Rule. Charism and Institution are always complementary elements for building the Church. What can I say to you, dear friends? First of all I would like to join you in thanking God for the long way he has granted you to come, filling you with his benefits. And as Pastor of the whole Church I want to thank him for the precious gift that you yourselves are for the Christian people in its entirety. The tiny stream that flowed from Mount Subasio has become a great river that has made a remarkable contribution to spreading the Gospel throughout the world. Everything began with the conversion of Francis who, after the example of Jesus, “emptied himself” (cf. Phil 2: 7), and, by espousing Our Lady Poverty, became a witness and herald of the Father who is in Heaven. Certain words that the Apostle Paul applies to himself and which I like to recall in this Pauline Year may be appropriately applied to the Poverello: “I have been crucified with Christ; it is no longer I who live, but Christ who lives in me; and the life I now live in the flesh I live by faith in the Son of God, who loved me and gave himself for me” (Gal 2: 20). And further, “Henceforth let no man trouble me; for I bear on my body the marks of Jesus” (Gal 6: 17). These texts from the Letter to the Galatians apply literally to the figure of St. Francis. Francis follows perfectly in Paul’s footsteps and one can truly say with him: “For to me to live is Christ” (Phil 1: 21). He experienced the power of divine grace and he is as it were dead and risen. All the riches he previously owned, every cause for vanity and security, all this became “loss” from the moment of his encounter with the Crucified and Risen Christ (cf. Phil 3: 7-11). At that point, leaving everything almost becomes necessary, in order to express the super-abundance of the gift received which is so great that it demands total self-emptying, which however does not suffice; it needs a whole life lived “in accordance with the form of the Holy Gospel (2 Test., 4: Fonti Francescane, 116). And here we come to the point that certainly lies at the heart of our meeting. I shall sum it up like this: the Gospel as a rule of life. 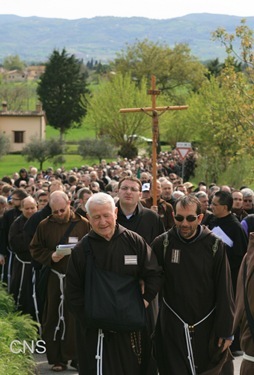 “The Rule and the Life of the Friars Minor is this, that is, to observe the Holy Gospel of Our Lord Jesus Christ”. This is what Francis wrote at the beginning of his Regula bullata (Rb I, 1: FF, 75). He understood himself entirely in the light of the Gospel. This is his fascination. This is his perennial timeliness. Thomas of Celano says that the Poverello “always carried Jesus in his heart. Jesus on his lips, Jesus is his ears, Jesus in his eyes, Jesus in his hands, Jesus in all his other members…. Indeed, finding himself frequently travelling and meditating on or praising Jesus, he would forget that he was on a journey and he would stop and invite all creatures to praise Jesus” (1 Cel., II, 9, 115: FF, 115). Thus the Poverello became a living Gospel, capable of attracting to Christ men and women of every epoch, especially young people who prefer radicalism to half measures. Bishop Guido of Assisi and, later, Pope Innocent III recognized the evangelical authenticity of the proposal of Francis and his companions and they were able to encourage their commitment, also in view of the good of the universal Church. Here a reflection springs spontaneously to mind: Francis might also not have gone to the Pope. Many religious groups and movements were forming at that time and some of them were opposed to the Church as an institution or at least did not seek her approval. A polemical attitude to the hierarchy would undoubtedly have gained Francis many followers. Instead, he immediately thought of putting his journey and that of his companions in the hands of the Bishop of Rome, the Successor of Peter. 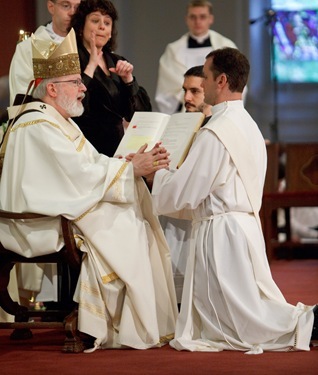 This act reveals his authentic ecclesial spirit. From the very first he had conceived of the little “we”, which had begun with his first friars, as being within the great “we” of the Church, one and universal. And the Pope recognized and appreciated this. Indeed, the Pope for his part might not have given his approval to Francis’ life project either. In fact we can easily imagine that some of Innocent III’s collaborators might have advised him not to approve it, perhaps fearing precisely that that little group of friars might resemble other heretical and pauperist cliques of the time. On the contrary, the Roman Pontiff, well informed by the Bishop of Assisi and by Cardinal Giovanni di San Paolo, was able to discern in it the initiative of the Holy Spirit and accepted, blessed and encouraged the nascent community of “friars minor”. 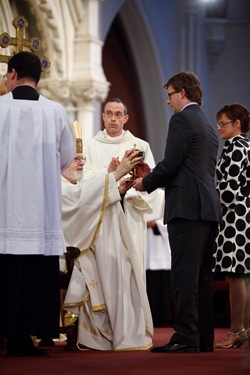 Dear brothers and sisters, eight centuries have passed and you have desired to renew the gesture of your Founder. All of you are children and heirs of those origins. From that “good seed” which was Francis, conformed in his turn to the “grain of wheat” which is the Lord Jesus, who died and was raised to bear much fruit (cf. Jn 12: 24). The Saints propose anew the fruitfulness of Christ. Like Francis and Clare of Assisi, you too strive to follow this same logic always: to lose your life in the cause of Jesus and the Gospel, in order to save it and make it abundantly fruitful. 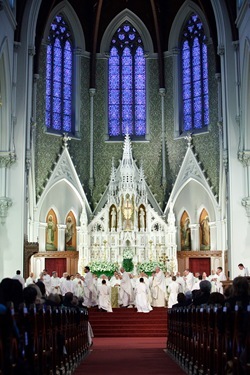 While you praise and thank the Lord who has called you to belong to such a large and beautiful “family”, continue to be attentive to what the Spirit says to it today, to each of its components, so that you may continue to proclaim the Kingdom of God fervently, treading in the footsteps of the Seraphic Father. May every brother and every sister always preserve a contemplative, simple and joyful heart: always set out anew from Christ, just as Francis set out from the gaze of the Crucifix of San Damiano and from the meeting with the leper, in order to see Christ’s Face in the suffering brethren and bring his peace to all. May you be witnesses of God’s “beauty”, which Francis was able to praise while contemplating the marvels of Creation, and which made him exclaim to the Most High “You are beauty!” (Lodi di Dio altissimo, 4,6: FF, 261). Dear friends, the last word I wish to leave you with is the same word that the Risen Jesus consigned to his disciples: “Go!” (cf. Mt 28: 19; Mk 16: 15). Go, and continue to “repair the house” of the Lord Jesus Christ, his Church. A few days ago the earthquake that struck the Abruzzo seriously damaged many churches and you of Assisi know well what this means. But there is another “ruin” which is far more serious: that of people and communities! Like Francis, always begin with yourselves. We are the first house that God wants to restore. If you are always able to renew yourselves in the spirit of the Gospel you will continue to help the Pastors of the Church to make her face as Christ’s Bride ever more beautiful. This is what the Pope expects of you, today, as at the outset. Thank you for coming! Go now and take the peace and love of Jesus Christ the Saviour to all. May Mary Immaculate, “the Virgin made Church” (cf. Greeting to the Blessed Virgin Mary, 1: FF, 259), always go with you. And may the Apostolic Blessing which I warmly impart to all of you present here and to the entire Franciscan Family sustain you always. This Sunday we celebrate Pentecost, which also marks the end of the Easter Season. I pray, particularly at this time, that we may all be filled with the Holy Spirit and filled with a renewed zeal to announce the saving Gospel of Jesus Christ.